MainAll NewsInside IsraelFictitious Party Meant to Harm Yachad? Fictitious Party Meant to Harm Yachad? Yachad says Shas created 'straw party' with similar letters - formerly of Marzel's party - to defraud voters. Netz - a straw list? 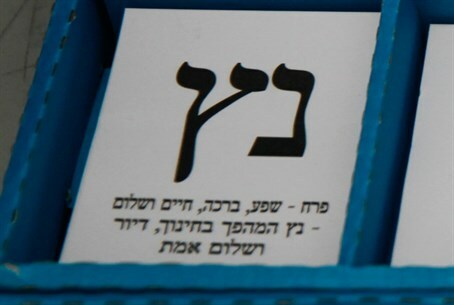 Many Israeli voters were confused in entering the ballot box Tuesday to see among the slips with Hebrew letters representing different parties two nearly identical ones side by side: קץ, representing the Yachad - Ha'am Itanu and Otzma Yehudit joint list, and נץ, which Yachad charges is a "straw party" meant to harm it. Otzma Yehudit, represented by Baruch Marzel at number four on the joint list with Ha'am Itanu, used the letters נץ (which means "hawk") in the last elections when it campaigned under the name Otzma Leyisrael, strengthening concerns that the anonymous list is, as Yachad charges, an underhanded ploy. The anonymous list features the bizarre and long-winded name "Perah - abundance blessing, life and peace - נץ the revolution in education, housing and true peace." Channel 2 reports that sources in Yachad charge the party is "a straw list registered by several yeshiva students close to Shas with the goal of confusing voters who want to vote 'קץ' and instead vote 'נץ,'" in this way stealing votes from the party. The Hebrew-language news site spoke with the wife of Marx Shlomo, who is listed as number one on the party list; she told the site her husband "can't speak," and that he isn't the head of the party but rather just on its list. Herbst Shalom Eliezer, number four on the list but considered founder of the party, told Channel 2 that he "knows (Shas chairman Aryeh) Deri," but also met with Yachad chairman Eli Yishai in the past and "wishes success to the two of them." Channel 2 points out that "Perah" does not appear to have run any elections campaigning or made any attempts to attract votes, and that it's attempts to contact the anonymous candidates on the list ran into difficulties. Shas has refused to directly address the serious accusations, merely saying "we're busy with doing things, not spin." There has been a high level of tension between Deri and Yishai, who formerly was Shas chairman after Deri was jailed for corruption in 1999 and only many years later came back to take over the haredi-Sephardic party. The enmity has been seen full-scale in the voting, as it has been reported that Shas activists have been hiding Yachad slips to block voters. Those underhanded tactics were seen early Tuesday afternoon when an activist from a haredi party, apparently Shas, was arrested at the ballot box on Hazon Ish Street in Jerusalem's Ramat Shlomo neighborhood. The activist was caught trying to steal the Yachad voting ballots, so as to block voters from exercising their democratic rights. The arrest marks the second today, after another activist stole Yachad slips in Tel Tzion. Yachad reports that at dozens of ballot boxes nationwide their slips have been stolen, damaged or forged to invalidate them. At several ballot boxes Yachad inspectors were even physically forced out by haredi party activists, to allow the illegal fraud to continue. The issue of how Yachad fares in the voting is not just an issue for the party alone. Polls have shown Yachad getting four or five mandates and passing the threshold but by a close enough margin to raise concerns - if the party doesn't pass it is widely estimated that Likud will be unable to establish a right-wing coalition.